I participate in the progressive image challenge over at From the Heart, and this is the image for April, I love the quote, it can relate to the actual winter/spring or can relate to trials and challenges and knowing that they won't last forever, there is a time and season for everything. I find it comforting either way! I colored with copics, added a touch of stickles on the flowers and then water colored the background. I really like how it turned out!! I used a very dark purple background paper (looks black in pic) yellow pattern paper and a hot pink strip, some lace and a brad. I think it turned out and looks really happy! So to all of my bloggy friends that are still in the middle of winter weather....this too shall pass and soon spring will show it's lovely face. For me in my area, we are enjoying spring and for us spring is a little short as we hit really high temps for most of the late spring into early fall... for now, I'm just enjoying the little bit cooler temps and hope they stick around for awhile longer! Such a gorgeous Spring card! I love the images & the sentiment is just perfect! Thanks for stopping by my blog & for leaving such a sweet comment! Wonderful card, image and quote. Thanks for joining us at Polkadoodles for our Springtime challenge. Oh I love the bright and cheery colors of your card. Thank you for coloring along with us at Chocolate, Coffee and Cards. Awesome spring card and great coloring. 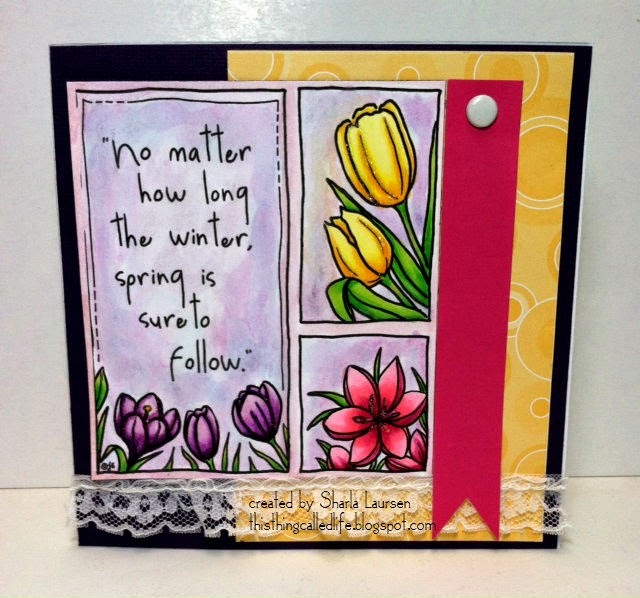 Thanks for joining our SOTM Challenge April 2014 @ From the Heart Stamps !! Thank you for sharing your creation with us at Craftin' Desert Divas. We are blessed to see your talent. Lovely!!! Beautiful card. Love the design and colors. Sharla, this is just beautiful! I love how you made the image the focal point of your card - it is beautifully colored - thank you for sharing your creativity with at FTHS and our SOTM Challenge!